Lean strips of grass-fed heritage steak are layered over a pan-fried mix of peppers, artichokes and broccoli, and served with a warm tomato & caper dressing. 1. Trim the purple sprouting broccoli and slice in half lengthways. Slice the roasted yellow pepper into long strips. Cut the artichokes into quarters. 2. Heat a frying pan with 1/2 tbsp oil on a medium heat and cook the purple sprouting broccoli for 5 mins, then add the roasted yellow pepper and artichokes for 3 mins. Remove from the pan and keep warm. 3. Meanwhile, finely dice the shallot. Roughly chop the cherry tomatoes. 4. Heat a separate frying pan with 1 tbsp oil on a medium-high heat. Season the steaks on both sides and place in the pan. Cook until golden brown, 2-3 mins each side for medium rare or 4-5 mins each side for well done. Remove from the pan and leave to rest while you make the dressing. 5. To make the warm dressing; in the same frying pan that the vegetables were in, heat 1/2 tbsp oil on a medium heat and cook the shallot for 3 mins, then add the cherry tomatoes, vinegar and capers and cook for 3 mins. Add a little water to thin the dressing if preferred. 6. Thinly slice the steaks. 7. 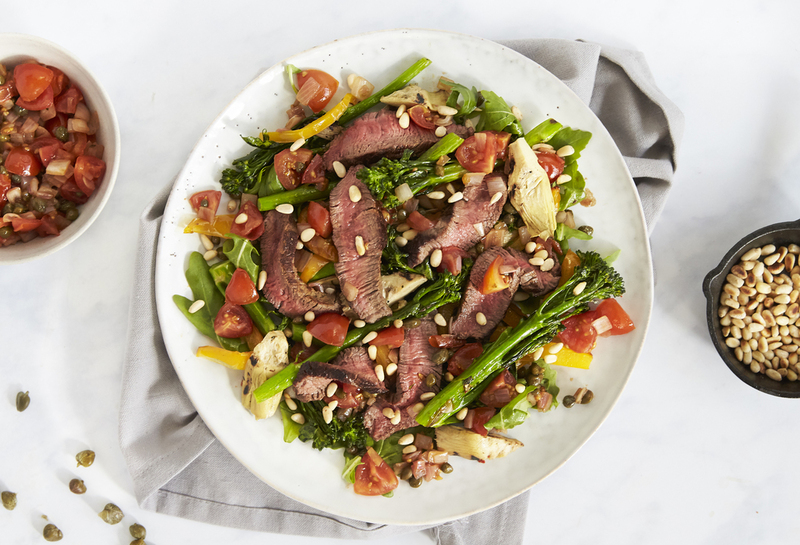 Arrange the rocket on two warm plates, top with the purple sprouting broccoli, yellow pepper, artichokes and steak strips. Spoon over the warm dressing and sprinkle over the pine nuts.